Location Carabao Scuba School is located in the south of the island, overlooking the crystal clear waters of easy accessible Chalok Baan Kao. Instructors & Dive masters Carabao Scuba School is an international diving school offering courses in many languages: English, French, Spanish, German and Dutch. Instructors are: Xavier (Master Instructor) form France, Julien (Open Water Instructor) from France, Gisella (Open Water Instructor) from Spain, Mike (Open Water Instructor) from the Netherlands and Sarah (Advanced Open Water Instructor) from Germany. Dive Masters are: Perry from the Netherlands and Sylvain and Yann from France. Infrastructure Bar, Classrooms, Coffee bar, Equipment shop, Lounge, Parking, Personal lockers, Shower, Storage room, WC, Wi-Fi, Beach, Massage, Restaurant, Pool tables, Snooker table, Big screen T.V. 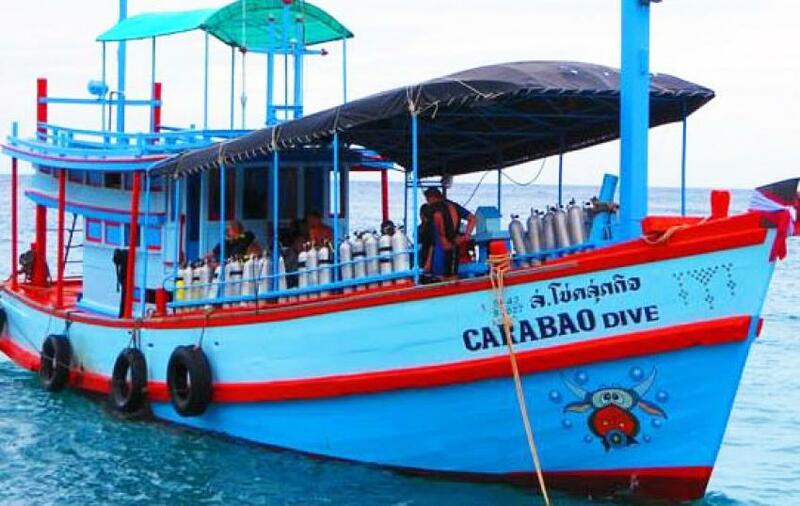 Carabao Scuba School has three spacious boats, one for maximum thirty divers, one for maximum twenty six divers and one for maximum twenty four divers. Read before you go It is a good idea to check a dive medical questionnaire, especially if you have never dived before. If you can answer no to all of the questions, no futher action is needed. Carabao offers a free taxi service from and to the pier, just let dive center know from where you are coming, the boat company's name and at what time.